An incredible vintage BMW model built using Lego, a Ducati GT1000 turned into a beautiful scrambler, and a Yamaha RD350 drag bike spitting out 90 horsepower. Let’s end the year with a bang. 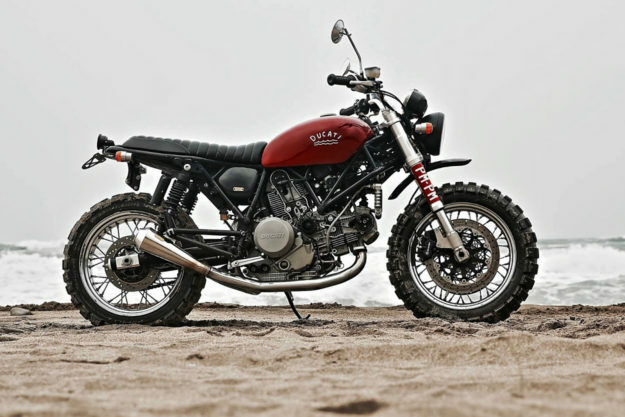 Ducati GT1000 by 2 Loud Whether it’s from a distance or close up, you’d be forgiven if you thought this scrambler rolled out of a Deus shop. I know I certainly did. The stance, the surfboard rack mounted on the port side… hell, even the font used on the tank is reminiscent of the Australian company’s ethos. But this isn’t a Deus bike. Based in New Taipei City, 2 Loud Custom Shop is um, quietly building a reputation for cranking out some exquisite rides. A quick perusal of their back catalog highlights some impressive skills. The latest to see the light of day is this Ducati GT1000, which has been given a scrambled aesthetic. Many of the changes are cosmetic in nature, but the execution looks spot on. 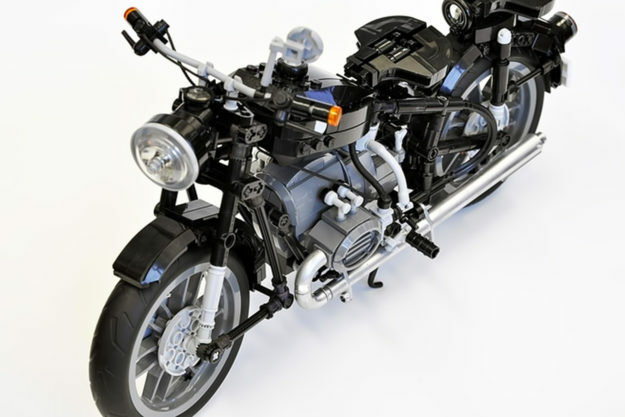 BMW R60/2 by Lego® It’s rare, but every now and then, we stumble across a build that every reader would probably love to own. It’s even rarer when that build is something most readers can afford—or put together themselves. Some of my fondest childhood memories are making vehicular dreams come true with a pile of plastic bricks. 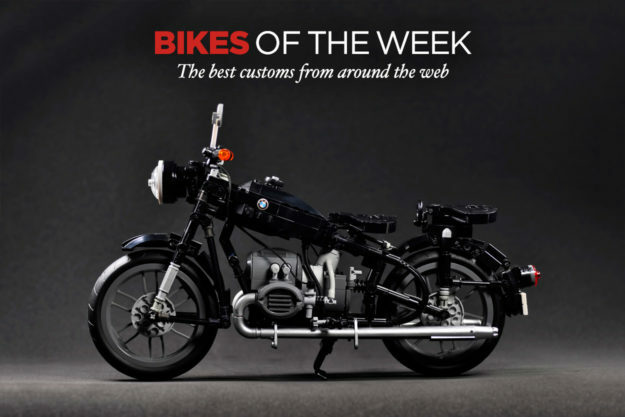 These days, Lego turns to outside sources for ideas for future kits, which hopefully will include this BMW R60/2—to keep my inner eight-year-old alive and kicking. Built by a Lego enthusiast in tribute to the Beemer his father used to run him around on, this R60/2 replica is rife with exacting detail. Even the Earles fork is present and accounted for, as well as the Hella-style bar end signals. The rumor is that a sidecar is also in the works for this kit, but we need to support it to make it happen: Voting is still open on the Lego Ideas page. With some help, hopefully we can land a few of these under the tree next Christmas. 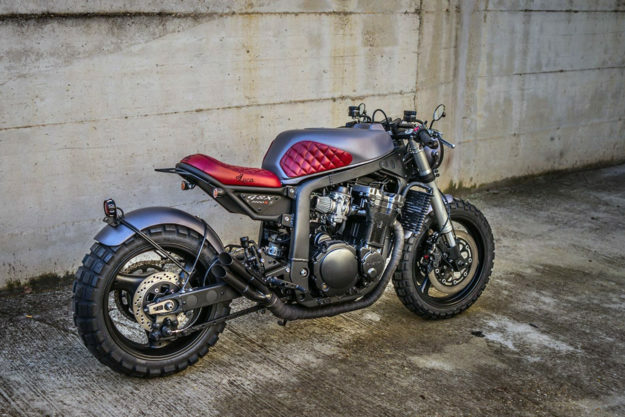 Suzuki GSX-R1100 by Motor più Garage Liter-bike power and a square-tubed, humpback frame aren’t typical ingredients when building an off-roader. Apparently, Italy’s Motor più Garage didn’t get that memo, and put a Gixxer 1100 on their bench for transformation to dirt duty. And we’re pretty pleased they did: ‘Luca’ looks like it should make some damned fine brapplesauce. 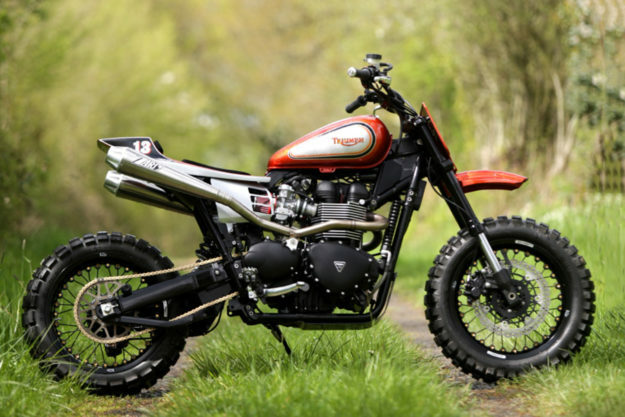 Street Scrambler by Triumph Saint-Lô When Triumph pulled the wraps off its new Street Scrambler, all of us in the EXIF office were pretty pleased. She’s a classy looking bike, if not fully trail-worthy right out of the crate. 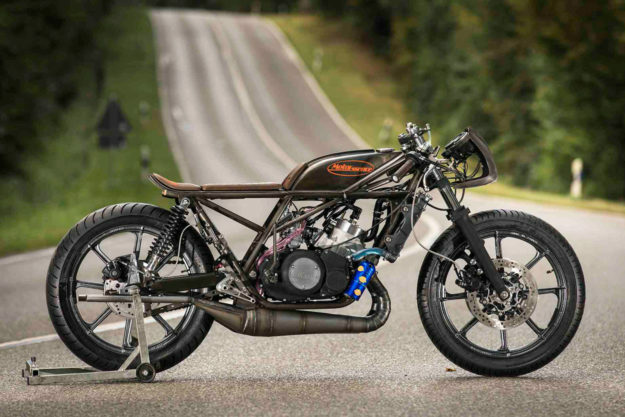 Yamaha RD350 by MotoEssence The Essenza 1/8th mile drags held at Glemseck and Intermot pitted 16 custom bikes against each other in a quest for speed. The rules were simple: only two-cylinder machines could enter, and engines had to be under 1200cc.